A battle is raging in companies around the world that's more intense than the fight for market share or margins. It’s the war for talent. Companies have always known that the right people are hard to find, and there's always been competition for the brightest, but the rise of social media and rapid fire sharing of global best practices have shown prospective employees what's possible. Now employers understand that they need to hire the best people who believe in the mission, keep them engaged and passionate or lose them and everything else becomes a moot point. The word on everyone’s mind is culture. But office culture doesn’t exist in a vacuum. Combined with people and space, it forms the trifecta responsible for the ethos of a company. The people create the culture, the right space supports and amplifies it while allowing people to do their best work, and this potent combination attracts more of the best people. If one of the three fails, the other two will feel the impact. 1. Develop a space that reflects the company's culture. Whether your firm values transparency or a flat hierarchy, find a way to represent that in your space. Ditch the walls or replace drywall with glass to show employees that everyone, from intern to executive, is seen and heard. Rid the work space of private offices to create an even playing field. Looking to exemplify your firm's irreverent hipness? Look no further than Red Frog Events, whose tree houses and slides are completely at home within the young organization. 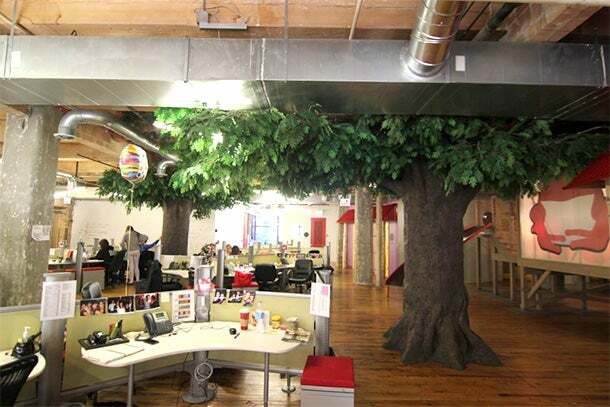 The Red Frog Events office bears two "tree house" spaces that are tapped for meetings and for breaks. 2. Cater to employees’ needs. Provide employees with the basics (light and comfortable chairs are a must) but know your employees and their work styles. Some developers like it dark: Let them have it. kCura has a dimly lit area in the middle of its office, and the team is grateful. Likewise, determine if employees work better in unconventional ways. Provide adjustable-height desks if people want to work standing up. 3. Remind people of home. People often gather in the office kitchen to connect, from open bar areas to mini coffee bars, Indeed Context Media has a full featured coffee bar. Make it easy with minor additions such as long picnic tables and comfortable couches. 4. Provide open gathering spaces and places to unwind. From Ifbyphone to Braintree, lots of offices are creating open areas suited for everything from quarterly meetings to departmental happy hours. Companies such as Vibes, Performics and Google offer spaces that encourage more employees wishing to relax or reset to have serendipitous encounters for unwinding and interacting with colleagues more informally. Just check out Google’s speakeasy. 5. Remove obstacles to innovation. Take the agency Tris3ct, which has walls of whiteboard, chalkboard and corkboard and that even encourages employees to tack ideas to light fixtures. Eureka moments can be fleeting, and it is in the firm’s DNA to cultivate every idea. The agency offers an example of how companies can (literally) put their values on the walls. In doing so, members of the team are reminded of the company’s core purpose and dedication to employees. Build furniture into hallway recesses, à la Conversant, or create cafe nooks for employees to take short breaks from their desks as Rightpoint did. An empty corner could be home to hammocks or bubble chairs -- and a productive team brainstorm. A company’s space is a critical part of its candidate value proposition and a recruitment tool. While ultimately a function of the culture, a work space provides employees with the means to do their best work and build the relationships that will make the team stronger -- and more ready to go to battle in the war for talent.